There has been a considerable rise in the waste production of Bengaluru in last 2 years to about 3000-5000 tonnes per day. Also due to limited budget allocated by government for waste management, approx 80% of the waste gets littered away, by some estimates. BBMP’s efforts to keep the city clean are just not enough and hence few responsible citizens have decided to take the necessary initiative. Meera Rajesh, an association member of Tungabhadra block of National Games Village (NGV), Koramangala, and an ecological enthusiast, with assistance from the Association for India’s Development (AID is a US headquartered non-profit organisation) is taking action to ensure zero waste in her residential area. Here is what she has to say about it. How does this Zero Waste Management work? Zero waste management (ZWM) makes use of waste material produced by the residents of the society. The organic waste is then separated from the total waste and is then decomposed using cow dung slurry to produce organic compost which can be put to number of usages like fertilizers in agriculture, organic material to process upon to produce electricity etc. What sustainable model of ZWM you have in mind and how effective is it? As an association of Tungabhadra block, we have discussed with the residents and they have agreed to help us by keeping their recyclable and non-recyclable waste in separate bins. A 12 women body, called as Stree Shakti, will then collect the waste of the block twice a day, in the morning and in the evening. They have formed an independent body and take care of their internal management by themselves. They will then separate it into primary and secondary category and mix it with cow dung slurry to prepare another bed of organic compost. It takes around 60 days for such a pile to get decayed into organic compost. Till now we have 4 beds of dry leaves each weighing 500kgs in the process of becoming organic compost and by 30th April we are expecting our first batch of organic compost being ready weighing about 2 tones. It’ll then be sold to vendors as fertilizers for agriculture and would be a source of these women’s salary and infrastructure’s maintenance. With 12 workingwomen and almost 200 residents involved in the plan of action everyday, how well does the micro-management work? 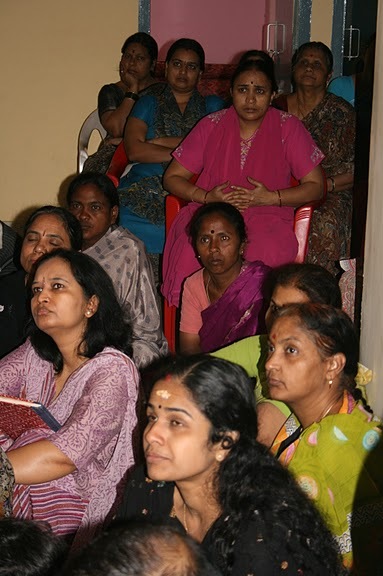 The Stree Shakti is being led by a 10th class pass lady and they all have good understanding between them. They are earning more than they were as a regular cleaning maid and that too without any interventions from a contractor. The residents were initially a bit reluctant to participate but with the awareness spread about eco-friendly environment and convincing of association, they not only helped us with seed money but also with efforts involving segregation of their garbage in red and green bins provided to them for organic and inorganic wastes respectively. What inspired you to go forward with the idea of ZWM project? C Srinivasan, who works closely with AID, has already converted this concept into actions at rural areas like Vellore, Sikkim and Gujarat and he has been a mastermind and a continuous source of knowledge for this project. He has already developed a sustaining model of ZWM in rural areas of Sikkim, Gujarat and Vellore. In the meanwhile, I also attended a workshop demonstrating Vellore’s model of ZWM by Dr. Meenakshi Bharath, Loksatta member and member of solid waste management round table. The benefits of ZWM are immense and so necessary in our present environment condition. It is like chicken-egg problem. India is basically agriculture-based economy. Farmers’ crops don’t do well because of lack of proper fertilizers and we are reluctant to recycle the waste we produce which is in huge quantities in metro areas. So if we do proper treatment of our waste and make organic compost for fertilizers, a connection will be made and a lot of problems can be solved of both rural and urban areas. Hence I talked to Srinivasan about it and we decided to take this up as our first urban project. AID (Association for India’s Development) Seattle chapter funding really boosted us to go forward with building our initial infrastructure and we were able to bring sponsorships from Cooperation bank, Union bank and Indian Overseas bank in forms of funding for bins, trolleys and posters etc. What are the major milestones planned ahead of this project? We are currently in the process of producing our first lot of organic compost, which can be used for multiple purposes. However, we are also trying if we can make Panchgavya, an organic fertiliser out of it. It is a very effective agricultural fertiliser made using cow dung, cow urine and organic food wastes subjected to organic decay. Apart from that we are also trying to improve the living standards of our workforce. We are planning education of these women, improving their working environment and training them for skilled ways to work. Plus there is always a scope to improve upon things we’ll continue serving the purpose. Why are you charged extra sometimes, by BMTC? Why doesn’t the BMTC fare look scientific? Here’s the answer. a resident of this building and attended the function on environmental day today. excellent work by the team. zero waste and generation of of 20,000 Rs in 2 mnths is spectacular!! great going!! very bice indeed, this has to be replicated in all localities for benefits to residents. Garbage originated daily in this Mega city is of the order of 5000tons, there is no place for BBMP to landfil in neighbouring villages, problem has ecome very acute now. we need to workup for recycling many things, garbage assumes priority.